Colonel Robert Morris was born in Memphis, Tennessee, to Ray and Mable Morris in the early '50s. 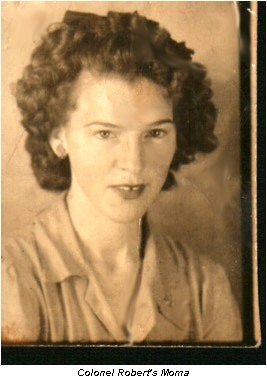 Colonel Robert cites his mother and her encouragement as his earliest influence. 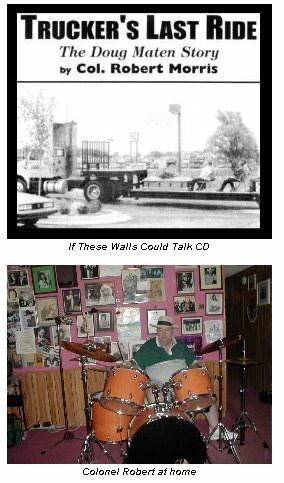 As a child, Robert taught himself to play the drums, by filling cans with different levels of water, to accomplish pitch. By the time he was a teenager, Robert was a working musician, working the "juke joints," in and around Memphis. As his reputation spread he became known as a "Master Drummer," and his talents were recruited by Charlie Feathers, Cordell Jackson, Billie Jo Spears, among many other artists and bands. Music has taken Robert around the globe. He has fond memories performing on the Eddie Bond Live Radio Show at the Western Steakhouse Lounge in Memphis. A highlight of his career was recording at the famous Sun Studios. Also hosting the Rockabilly/Country music festival in 2001 will never be forgotten. Today, Robert & Irene enjoy writing songs, helping other writers and artists, plus performing the occasional show. 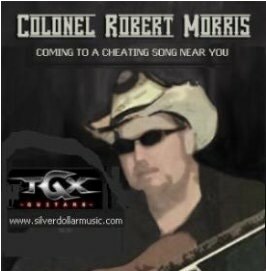 To date, Colonel Robert Morris has well over 700 songs in his catalog, including the classics: "Truckers Last Ride" "If These Walls Could Talk" "Rockabilly Town" " Second Hand Ring" and " Midnight With Elvis","an homage to the King that Robert knew so well. 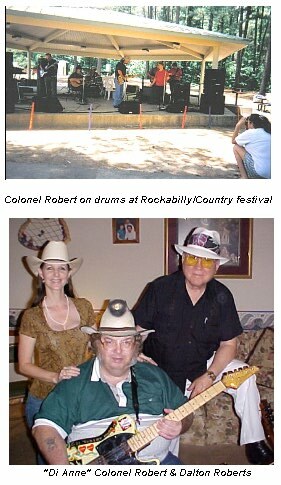 Colonel Robert has literally had hit songs around the globe. Germany, Austria, Holland and Australia have all had The Colonel's songs on their charts. He is currently writing his autobiography, "A Honky Tonk Life." Colonel Robert and his wife Irene, are also the founders of Silver Dollar Music, and they host interviews of country radio personalities for the Traditional Country Hall Of Fame. They currently reside in Senatobia, Mississippi. The Music world has bestowed many honors on Colonel Morris. 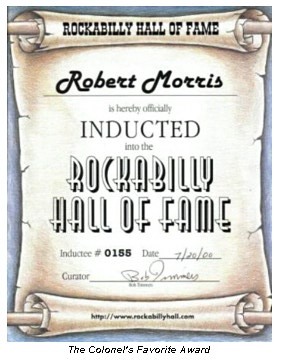 He has been inducted into the Rockabilly Hall Of Fame, and The Traditional Country Hall Of Fame. Colonel Robert was presented with the Pioneers Lifetime Achievement Award, The Mississippi State Governors Award, Tennessee State Governors Award, The Key to the city of Memphis, and made a Tennessee State Colonel in 2000. 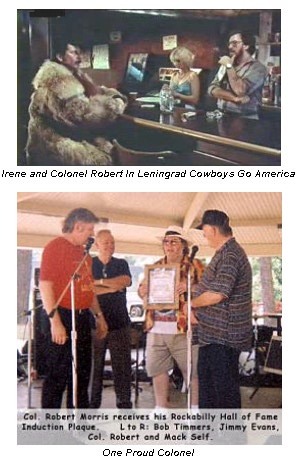 Robert and Irene Morris also shared a cameo role in the Finnish film, Leningrad Cowboys Go America.